The field of psychology is usually ignored by mainstream economists, which, in its typically arrogant and closed practice, adopts a series of a priori assumptions about human behaviour – the so-called Homo economicus – where were are always rational and self-interested and, as a result, always make choices that maximise our present and future well-being based on available market signals. Real world forces that condition actual human behaviour, such as cognitive biases and irrationality, in general, as well as cooperative and collective behaviour is ignored by mainstream neo-classical (free market) economic theory, because admitting its dominance in human decision-making would void the entire edifice of that theory and scuttle the authority that is given to the on-going narratives about deregulation, small government, privatisation, pernicious cutting of income support, and the rest of the economic policies that have defined this dysfunctional neo-liberal era. But humans do not behave in the way economists suggest. We are a complex mass of irrationality, custom, habit, and affect. We certainly use cognitive processes in our decision making but often we take shortcuts based on affect. These tendencies are pushing our behaviour back to what was normal before the credit binge that led to the GFC. This shift in our behaviour is associated with stagnation and entrenched mass unemployment. But the reason for these parlous outcomes is not that we have returned to more normal spending behaviour but, rather, because governments have not realised that they had to return to more normal behaviour as well. Instead of promoting the benefits of austerity (in the face of all evidence to the contrary), governments should have been promoting the benefits of continuous fiscal deficits to support non-government saving desires and maintain better employment outcomes and stronger income growth. The malaise advanced nations are stuck in at present is directly the result of ideologically-motivated choices made by governments to use to use fiscal policy properly. Neo-liberal ideology remains dominant but citizens are rebelling and something has to give. The Homo Economicus myth is how mainstream economists can bring about the impossible and explain mass unemployment as a voluntary, maximising choice by the jobless to enjoy more leisure. Such a conception defies all evidence and is negated by countless studies in sociology, psychology, health sciences, etc. Mainstream economics turns a simple concept – a lack of jobs relative to the number of people wanting jobs, which arises from a lack of overall spending in the economy relative to the productive capacity of the economy – into a mind boggling construct, replete with complex mathematical justifications and curious ‘corner-solution’ diagrams. Students get bored learning this complex coverup but a fair proportion develop sociopathological tendencies by the third-year of their university studies in economics. Some go on to work in places like the IMF, the Department of Work and Pensions in the UK, the Department of Employment and Workplace Relations in Australia and elsewhere where they design and adminster pernicious, anti-people policies in the name of their economic ‘purity’. It is a fraudulent practice they follow. It is also how moronic ideas that dominate mainstream macroeconomics, such as Ricardian Equivalence, find oxygen and are picked up by financial journalists who, in general, know very little about what they write, and repeated continually, each time there some politician says that cutting fiscal deficits with spending cuts will enhance growth. The claim is that if governments cut their spending the private sector will more than fill the gap. Why? The claim is that when fiscal deficits rise, private spending is weak because households and firms are scared that the government will increase future taxes to ‘pay back the deficit’. Accordingly, households and firms start saving more to ensure they have these funds in the future. Once freed of this imperative by a fiscal austerity program, the private sector engages on a spending boom and all is well. Once again, there are papers that engage the readers in hours of tedious mathematics and reasoning, which allegedly, ‘prove’ this theorem. But, the overwhelming evidence shows that firms will not invest while consumption is weak and households will not spend because they scared of becoming unemployed and are trying to reduce their bloated debt levels. Ricardian Equivalence only exists in the land of the neo-liberal pixies! In this tradition, Modern Monetary Theory (MMT) has never concerned itself with computing “how many angels can dance on the head of a pin”. It is not an imaginary approach that deals with imaginary problems. It is about the real world and starts with some basic macroeconomic principles like – spending equals income. We leave the angel-counting to the New Keynesians and their Dynamic Stochastic General Equilibrium (DSGE) models. One idea developed in psychology that is extremely useful in understanding the way the economy might move is that of the Affect heuristic. … the main focus of descriptive decision research has been cognitive, rather than affective. The cognitive bias is shared by mainstream economists who emphasise rationality and maximisation. However, more recently, the “role for affect” (p.1334) or “affective judgements” in the way people make decisions have been studied more. … affect may serve as a cue for many important judgments. Using an overall, readily available affective impression can be far easier—more efficient—than weighing the pros and cons or retrieving from memory many relevant examples, especially when the required judgment or decision is complex or mental resources are limited. This characterization of a mental short-cut leads to labeling the use of affect a ‘heuristic’. The affect heuristic helps us explain the so-called German ‘inflation angst’, which stems from a period in the 1920s that has become so etched in the German culture, despite the special conditions that drove the hyperinflation not being repeated since (nor likely to in the future). That ‘affect’ dominates German economic policy and its approach to other nations, such as the social torture it is primarily responsible for inflicting on Greece. The Great Depression also created a strong ‘affect heuristic’. This was noted in a speech – The Spectre of Monetarism – given by the Bank of England governor Mark Carney yesterday (December 5, 2016) at a university in Liverpool. The warning was in relation to growing working discontent with the spoils that were coming their way from the industrial revolution under Capitalism. Then, the first machine age was rampant. Now, we are experiencing the early days of the second machine age. Carney thinks that the we now have “dynamics that echo those of 150 years ago”. … the view that the dynamics of money have a temporary influence on demand and, via the celebrated “quantity equation”, a major influence of prices. Here I am using the term in a broader sense, to describe the view that monetary policy is the only tool necessary to stabilise the economy. Friedman advocated the control of money as superior to fiscal measures for stabilising the economy … he advocated a constant growth rate of the money stock as a means to stabilise the economy effectively. Following the experiences of the 1980s, there is today great scepticism that the velocity of money circulation exhibits the kind of stability necessary to make the quantity equation operative as a means of inflation control, although money may still have useful information content as an indicator. The point he was making is that a reliance on monetary policy alone and, more specifically, some notion that central bankers can control the monetary aggregates (money supply) is an unhelpful legacy of the Monetarist emergence in the early 1970s, which morphed into full-blown neo-liberalism in the decades that followed. By abandoning fiscal policy as a powerful tool to stabilise economic dynamics we have generated a cycle of weak income growth and rising inequality in most advanced nations. The grinding attempt to neuter government activism and to place responsibility for managing macroeconomic cycles in the hands of unelected central bank technocrats, who define their intervention only in terms of price stability and use unemployment as a policy tool rather than see it as a primary policy target, has resulted in weak economic growth, elevated levels of unemployment and underemployment, and generalised malaise. … many citizens in advanced economies are facing heightened uncertainty, lamenting a loss of control and losing trust in the system … Rather than a new golden era, globalisation is associated with low wages, insecure employment, stateless corporations and striking inequalities. These anxieties have been compounded by the twin crises of solvency and integrity at the heart of finance. When the financial crisis hit, the world’s largest banks were shown to be operating in a “heads-I-win-tails- you-lose” bubble; widespread rigging of some core markets was exposed; and masters of the universe became minions. Few in positions of responsibility took theirs. Shareholders, taxpayers and citizens paid the heavy price. And this has led citizens to reject the on-going statements from mainstream economists who continue to exhort the benefits of ‘free markets’. As Carney notes “public support for open markets is under threat”. The reality is that people are starting to realise that the ‘free market’ construction is a venal lie – there is no such thing as the textbook ‘free market’ in the real world, that economists pine for and convince governments to pursue. Instead, people are working out that the policies that have been pursued – ostensibly in the name of ‘freeing’ up the markets – are really just biasing outcomes increasingly to the top-end-of-town – the establishment – at the expense of the rest of us. The con job is being exposed and while most people cannot yet see an alternative they certainly know something is wrong with the status quo and are expressing this angst as a rebellion through the voting systems (Brexit, Trump, Italian referendum and more instances will follow). The proportion of the wealth held by the richest 1% of Americans increased from 25% in 1990 to 40% in 2012 …. Globally, the share of wealth held by the richest 1% in the world rose from one-third in 2000 to one-half in 2010. We are increasingly attaching words like ‘obscenity’ to these data revelations. There is no possible way that the trends such as those above can be massaged in the public domain to appear reasonable or functional. We now know they are the product of cheating, lying, and complicity between government and capital to tilt the playing field towards the latter and to screw the workers. Mass unemployment and rising underemployment has a way of suppressing wage demands, even those that would be fully justified by productivity growth. However, the gap between real wages growth and productivity growth has been rising around the world meaning that profits is gaining a greater share of real income at the expense of those who actually produce the output – the workers. While most people do not know what the wage share is and how its dynamics work, they know more generally they are being screwed. We are confronted with governments that tell us they have to cut their spending because rising unemployment is reducing their tax revenue and so they have to strive harder to balance their fiscal situation. 30 years ago we understood clearly that the role of the government was to use its net spending powers (spending and taxation) to work counter with the non-government spending cycle to make sure that output growth was commensurate with full employment. It was clear why governments should act in that way. When the spending growth of the non-government falls below that necessary to maintain aggregate demand sufficient to buy all the output being made, the only way the economy can avoid falling output and, ultimately, recession, is if the government net spending rises to fill the gap. That understanding was so ingrained in the psyche of the population that governments were forced to act in this way. That knowledge has never been shown to be false. The rise of Monetarism never provided a knowledge-based rejection of our understanding of the essential counter-cyclical role that governments have to play to ensure there is prosperity for all. Nothing leads to rising inequality more than suppressed real wages growth and mass unemployment. When governments ensured there was enough spending in the economy both real wages growth and unemployment were such that workers were able to enjoy material advances in living standards. We all had a stake in the growth cycle. Not now. Monetarism was a massive con job. It has morphed into an even greater web of myths (lies) and public deception. We now no longer trust governments who prop up the elite but, at the same time, we express this distrust in a general disdain for state involvement in the economy. That is the problem that progressives face – how to hold out the state as a progressive force (and an essential force for prosperity in a monetary economy) when it has been so co-opted by the elites and used to feather their nests at the expense of the rest of us. While this characterisation is undoubtely true, the working of the ‘affect heuristic’ is also seeing non-government entities such as households and firms returning to behaviours that are more historically typical. … it is rightly the role of elected governments to take measures to offset them if they so choose. There is no question that currency-issuing governments have immense capacities to alter the course of the economic cycle. There is no financial crisis big enough that cannot be solved by government intervention. Please read my blog – There is no financial crisis so deep that cannot be dealt with by public spending – still! – for more discussion on this point. In the early days of the financial crisis, mainstream economists came out in denial and argued, according to their neo-liberal mantra, that fiscal policy was ineffective. The fiscal interventions proved them wrong but, ultimately, governments were cowed into withdrawing their fiscal stimulus packages far too early and were too timid in their initial interventions for the same reason. The mainstream mantra really started to take hold in 2011 and 2012 and full-blown austerity was imposed in the Eurozone as well as other places. The results have been catastrophic for some nations and some citizen cohorts within nations. Governments thus made a ‘choice’. Fiscal policy didn’t become ineffective in 2011 or 2012. It was just abused by austerity-mania. Our use of the ‘affect heuristic’ has seen us flee back into behaviour that pre-dated the lead up to the crisis. We feel that there is something wrong even though the economists are claiming otherwise. We feel the need to return to more stable times, more controlled use of credit, less debt and more saving. Firms are becoming much more cautious about investment and aligning their capital infrastructure decisions with how they feel about future sales. In times of relative stability consumer spending patterns exhibit stability. One of the essential conditions for stability is that private balance sheets are sustainable which is tantamount to saying that consumption growth is driven by real wages growth which is proportional to productivity growth. In the neo-liberal (last 25-30 years) this pattern was interrupted as governments attacked the capacity of workers to secure real wages growth in line with the growth in productivity. The massive redistribution of national income towards profits that has been characteristics of the neo-liberal period to date has provided evidence of that. This real income grab provided the resources for the financial sector which allowed it to grow so spectacularly. It also meant that consumption growth had to be ‘funded’ via the acceleration of credit which over time led to the deterioration in private balance sheets and, ultimately, the financial collapse. However, with flat real wages growth and excessive levels of private debt in the system, spending patterns are now more cautious. Confidence is a key to spending. Expectations and confidence are slippery concepts for economists who want to reduce everything to optimising calculus (the main tools of mainstream economics) – the cognitive bias. But we know that when there is unemployment and falling income, private confidence will be low and subdued spending behaviour will follow. Firms will not invest until they are sure that they can sell the extra output that would be produced by the new productive infrastructure. Consumers will not provide them with those guarantees because they are worried about their job viability. In the current period, we also have to add in the fact that the non-government balance sheet is bloated with debt and this will require years of private deleveraging to restore the sustainability of private balance sheets. The result – a very drawn out period of subdued private spending overall. Under those conditions, sustained fiscal deficits are required to support aggregate spending growth, which in turn, helps the private sector regain confidence. But the return to caution is not just about balance sheet adjustment. Households are lifting their saving out of disposable income and private investment remains relative subdued as part of a long-term adjustment to return our behaviour back to what we ‘feel’ is normal, and through experience or affect, is stable. 1. The government will more likely have to run fiscal deficits of some magnitude indefinitely – as in the past. We will have to re-learn that continuous fiscal deficits of varying magnitudes are normal and to be sought rather than demonised. 2. Real wages growth will have to be more closely aligned with productivity growth to break the reliance on credit growth. This reality should allow us to understand that the quest for fiscal austerity – ‘balanced budgets’ – is a mindless and very destructive aspiration. Where will growth ever come from if consumers are returning to higher saving ratios, firms are very cautious, all countries are eroding each other’s export markets, and governments are adding to the malaise? Answer: nowhere. That is the problem. The problem has been that governments have refused to take leadership and responsibility for steering their economies back into safer waters and have, instead, fallen prey to all the lies about fiscal deficits and have sought ways to get back into fiscal surplus – as if that state is the norm. Please read my blog – Budget deficits are part of “new” normal private sector behaviour – for more discussion on this point. To finish – consider what constitutes normal behaviour for a currency-issuing government. I use the US as an example but I could have picked almost any nation. The US fiscal data – Table 1.2—Summary of Receipts, Outlays, and Surpluses or Deficits (-) as Percentages of GDP: 1930–2021 – is always worth consulting (from time to time) to realign your perceptions of the historical record and to wash away the ‘current’ mass of misinformation that reflects the dominant neo-liberal approach. History spans different ideological periods and is valuable in the process of helping us see things outside of the compelling forces of Groupthink. The following graph shows the government fiscal position (positive = surplus) from 1930 to 2016. The fiscal balance has been in deficit in 74 of the 87 years or 85 per cent of the time. 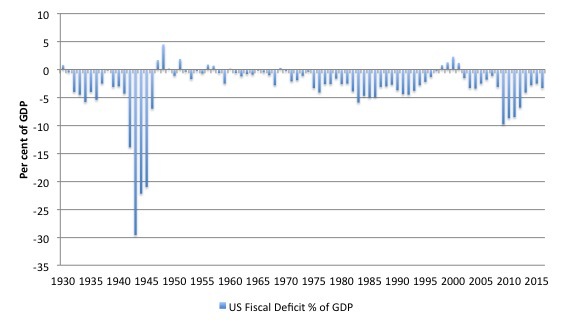 My MMT colleague and friend Randy Wray (with Yeva Nersisyan) analysed fiscal positions in the US back to 1776 in their 2010 Public Policy Brief – Deficit Hysteria Redux? Why We Should Stop Worrying About U.S. Government Deficits. With one brief exception, the federal government has been in debt every year since 1776. There have been seven periods of substantial budget surpluses and debt reductions, followed by six periods of depression. One finds that every significant reduction of the outstanding debt, with the exception of the Clinton surpluses (which were followed by the Bush recession), has been followed by a depression. Moreover, our less serious downturns in the postwar period have almost always been preceded by a reduction of the federal budget deficit. Our ‘affect heuristic’ leads us to act cautiously when unemployment rises. However, there is now a cognitive gap that distorts the way in which this heuristic influences the way we see the role of government. We know and feel that governments are letting us down and working hand-in-glove with the elites to further their interests at our expense. But we haven’t, yet, related that ‘affect’ to a more logical understanding of why neo-liberalism has undermined the use of the intrinsic capacities of currency-issuing governments to advance our welfare. We are confused and are hitting out at anything that looks like the establishment. We would be better of ‘getting even’ which in this case requires us to learn more about these capacities and to understand what historically normal behaviour is. Fiscal surpluses are aberrations in most cases – historically atypical behaviour. We should eschew the pursuit of the same. Not, in the U.K., according to M. Carney? “Two excerpts from articles that appeared in the Livemint of 20 October 2014 show how the need to achieve a fiscal deficit target is becoming an end in itself. More than the fiscal deficit number per se the debate needs to focus on the real effects of subsidies in distorting resource allocation (if that is so) and the unproductive expenditure of the government that fails to ease supply side constraints and raise productivity. There is surely space for an MMT perspective on these issues. Is the centre finally cracking down on subsidies? The move will also enable the government to meet its fiscal deficit target of 4.1% of gross domestic product (GDP), even after taking into account the expected shortfall in revenue collections. A Union cabinet minister, who did not wish to be identified, pointed out that the government cannot afford to continue with the current subsidy regime. “There are no freebies. We cannot afford to bankrupt the state exchequer,” the minister said, signalling the central government’s intent to overhaul the subsidy regime. The first task in ensuring a low inflation environment is to eliminate the primary deficit. This deficit is the difference between the total revenue and total expenditure of the government with debt payments netted out of the calculation. India must begin to deliver upon both a primary and fiscal deficit target as measures of fiscal consolidation in its annual budget. The elimination of the primary deficit and a reduction in the fiscal deficit (to say 2.5% of GDP) will ensure that we live within our means each year, do not increase the stock of debt and crowd out less capital from the productive economy. If you find the time, I’d be very much interested in your take on this in the Indian context. His argument essentially relies upon the idea that if governments spend in a manner that people dont like, then investors can shift their preferences away from that particular currency(US dollar in this case) and move to another currency. If they need to switch to the former for paying at point of sale(for example), they can do instant transaction switches with the help of, I assume, digital systems like cards. Although it does sound right, I presume it would take a lot of abuse of the US dollar to have the general public abandon it. If someone like George Soros did that, then that would simply show where his politics lie. The hypocrisy of Homo Economicus is revealed by how “economic experts” invest their money. Not in productive, economically “rational” enterprises but rather mythical “unicorn” enterprises. Where is the company who puts the ricardian equivalence theory into practice? I can’t think of one. But out of the other side of their laughing mouth all the experts put their money into “affect hueristic” driven companies using reality. Or are Facebook, google and all the advertising internet money appealling to the real economic atom of Homo Economicus? I doubt that economic ideas produced by academic economists have all that much influence on policy. Ask professors outside the economics faculty what Ricardian equivalence is, and I bet that most of them will tell you that they don’t have a clue. The reason why most people are opposed to continues budget deficits is that they compare a government with a household, as Angela Merkel believes that a frugal “Schwäbische Hausfrau”, who always tries to spend a bit less that her income, is a model for sound fiscal policy. The ideas that a government is like a household, and therefore should not go too deep into debt, and that an economy is like a company, and therefore should try to maximize sales (exports), will be around for a long time yet because they have a common-sense appeal. MMT’ers face an uphill battle in their endeavors to change public opinion. I think they get used as arguing points to shore up proposals by people with interests. Why else would Larry Summers be speaking in public? Why else would we read this blog? Back before the implosion, I’m sure few securities salesmen understood the math behind the derivative MBS they were selling, but I’m sure the existence of the math, understood or not, convinced the rating agencies to rank those MBS high and promote the sales. These propose that rational thinking (Kahnemann’s Slow Thinking, McGilchrist’s Left-hemisphere Thinking) handles abstractions and the calculation of logical results from known definitions annd axioms. Affect can be thought of (Kahnemmann’s Fast Thinking, McGilchrist’s Right-hemisphere Thinking) as pattern-matching using the entire set of perceptions available at the moment. Language use is more related to Slow/Left processes, so we can’t often give a rigorous account of our Fast/Right decisions. Later in his book, McGilchrist pushes a neuro-political point that our culture gives far too much influence to purely left-hemisphere processes, and too much privilege to unalloyed rationality. Siting each of these processes in its own cranial hardware emphasizes that each of these processes is going an all the time, and each is always available for use. Healthy thinking, he says, involves a process he calls Aufhebung (borrowed it from Hegel, it seems) in which the Right-hemisphere picks up a rational result from the Left-hemisphere’s out-basket (as it were) and holds it up for comparison with the current perceived state of affairs (or Gestalt) to see how realistic it really is. Without that we can run off in all kinds of strange directions — just as it appears we have done. You know what side of the author’s bread is buttered – i.e. non-productive financial speculation. You may also be interested in the subject of brain development. Neo-liberals attach a lot of weight to the concept of ‘creative destruction’. Particularly when itcomes to welfare policy. They seem to believe that putting an individual under stress (destruction) forces them to adapt and change (creation). We now know, however, that the brain stops developing at the age of about 25 years. Beyond that, an individual may be able to use some psychological ways of adapting to change, but the neurological ways of adapting are no longer open to them. My best guess is that around this age, government can no longer can expect a person to change in response to crude and patronising welfare policies, and instead, should accept and accommodate people for their behaviour as far as is practicably possible. Even well before a person reaches 25 years old, government should increasingly become more cautious about policies that rely on those individuals to adapt in response in to government policies. Bill, I accept your analysis and believe MMT provides the roadmap to enable nations to follow optimum macroeconomic settings and thereby greatly improve people’s lives, eliminate unemployment and potentially also drive the essential transition to clean energy and environmental sustainability. Although many others also agree with your economic analysis, it is unlikely that those that currently define macroeconomic policy will ever en masse convert to MMT but what is more likely is that they will adopt parts of it. For example many central bank heads and some politicians are now talking about the need for fiscal stimulus in the form of infrastructure spending in order to provide some economic growth and to improve the rates of return on investments by the elite that have recently hit growth limits with share market and real estate speculation and negligible rates of interest on cash investments. Such compromises by the elites will however be packaged in the same neoliberal cancer that has caused so much damage and will continue to cause damage. The new wealth arising from fiscal stimulus will probably also predominately find its way into the hands of the wealthiest few percent. The populace in general will probably never understand MMT but they never really understood Monetarism or Keynesian economics either. Bernie Sanders successfully presented a message and realistic vision for the U.S. that was understood and accepted by the electorate and he accepted the macroeconomic advice of MMT economists like Stephanie Kelton and Pavlina Tcherneva. Many believe Sanders would have won the 2016 Presidential election if he wasn’t blocked by the leadership and establishment backers of the Democratic Party. This is therefore likely to be the best path for quick and substantial acceptance of MMT macroeconomics – winning over key progressive or centralist leaders and political parties. The fossil fuel loving corporate dinosaurs must be pushed from power, all the corporate lobbyists and vested interests that have corrupted our democracies must be removed and at the same time the proponents of neoliberalism that have caused so much damage to the developed world’s economies and created record levels of wealth inequity, unemployment and hardship need to join them in the rubbish bin of history. Public discontent is definitely building and the earth’s global warming threat continues to worsen. It’s time for some serious repairs. Excellent piece. However, it seems that certain influential UK macro economic Professors (at least influential enough to organise letters to the press on behalf of the ‘majority’), take petulant exception to people of other disciplines making suggestions. I agree with you. The irony is that private, and in particular household, debt has been positively encouraged, i.e. ordinary people are encouraged to live beyond their means in order to keep the bubble of consumption expanding. Add to that student and inflated mortgage debt, and the result is Micawberian misery.